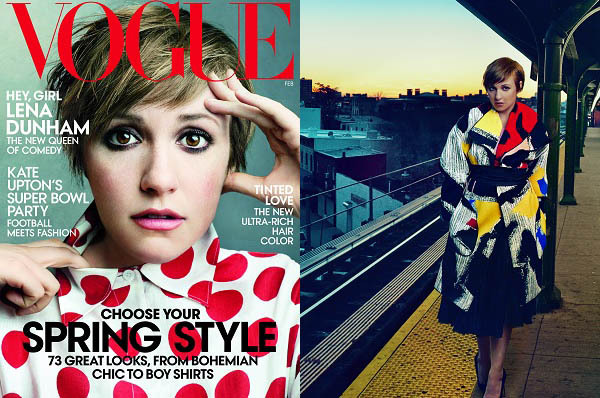 Lena Dunham’s Vogue cover: Was the photo editing that bad? Lena Dunham’s Vogue cover and spread looked quite awesome, but when the un-retouched images of the photo shoot surfaced, they caused a big commotion among fans. Lena Dunham‘s Vogue photos were all the rage, until the un-retouched versions were released to the public for all to see. While some editing can clearly be seen, the backlash unleashed by the Girls star’s fans and critics alike was probably exaggerated. After Dunham’s photos with Vogue were published, Jezebel.com made an offer to give $10,000 in exchange for her un-retouched images because they knew the magazine’s photos were not “real.” Within two hours they had their photos and posted them on their site for everyone to see the differences. Many enhancements can obviously be seen, but that’s what Vogue and most other fashion magazines are known to do with their photo shoots. Even the most flawless of women get retouched on their pictures. However, since Dunham is known for admitting that her body is “a realistic expression of what it’s like to be alive,” and her shape is real, bulges and all, some took offense that she was photoshopped in her spread. Meanwhile, while Dunham was not amused with Jezebel’s move to pay for the original photos, she does not seem bothered by Vogue‘s altering of her images. Additionally, some feel that this was a good move by Vogue and that they are “winning” this controversial debacle.